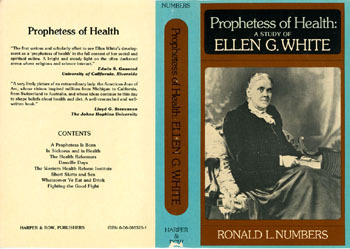 Ronald L. Numbers, Prophetess of Health: A Study of Ellen G. White (Harper & Row, 1976), 271 pages. Ellen G. White who lived from 1827 to 1915 ranks with Joseph Smith and Mary Baker Eddy among the most fascinating and influential religious figures in nineteenth-century America. Yet only now is the story of her remarkable career as a health reformer and religious leader available for the general reader. From a childhood filled with physical and psychological trauma, Ellen G. White by the 1860s had emerged, largely through trance-like visions, to the leadership of a band of millennialists called Seventh-day Adventists. Her visions, which she claimed were as divinely inspired as those given to the biblical prophets, successfully guided the fledgling church through its first critical decades and are even today considered authoritative by her more than two million followers around the world. In this story of Mrs. White’s career as a health reformer, Ronald L. Numbers tells not only of her interest in vegetarianism, hydropathy (the curing of disease by water), and the building of sanitariums, but also of her little-known excursions into the areas of phrenology, sexual advice, and dress design. Moreover, the author has uncovered contemporary writings prior to Ellen White’s visions that are often embarrassingly similar in thought—and, in some cases, in phrasing—to Mrs. White’s own accounts, which she insisted came directly from God. These parallels are fully documented and quoted in Prophetess of Health. Drawing from letters, testimonies, and manuscripts (many never before available) of Mrs. White and her associates. Numbers fully situates her teachings in the social and medical currents of her time without losing sight of a unique woman whose accomplishments were very much her own. The author neither relishes nor shies from his controversial findings. Prophetess of Health seeks not to condemn or to defend, but simply to understand a multi-faced woman who has encouraged millions to live healthier and more productive lives. Ronald L. Numbers was in 1976 Assistant Professor of the History of Medicine and the History of Science at the University of Wisconsin in Madison. Only a few NEW copies of this first-edition Adventist classic remain from the original Harper & Row printing.